Remember this little book? Our pal Rob Shepperson illustrated it and we’ve had fun with it since it appeared in 2007. 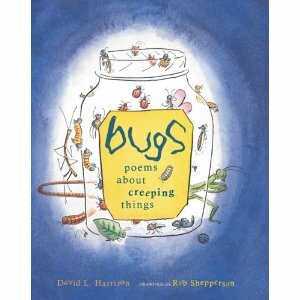 Early on it was selected for the “Seeing Stories” exhibition at the Westchester Art Center and appeared on the New York Public Library’s annual list of 100 titles of “Children’s Books for Reading and Sharing.” In 2008 BUGS was chosen as an NCTE Notable Poetry Book. So yay for BUGS. A friend of Rob’s is music director Patrick Reynolds who conducts the youth symphony orchestra in Dayton, Ohio. This is an old and honored musical program that dates back many decades. This Sunday, March 30, is the symphony’s final performance of this season, one that is billed as the annual Family Concert. Patrick has chosen to bill this particular concert as BUGS. The musicians will be joined by the Dayton Ballet II. Here’s the scoop. https://daytonperformingarts.org/content.jsp?articleId=3248. Here’s a sample from the book, one that’s named in the program description and will presumably be floating on the screen above the musicians’ heads. Wif giraffe in hif mouf. As he always does, Rob greatly enhances the poem with his droll drawings. If you live in the Dayton area or have friends or family there, tell them to check out the BUGS concert on the 30th. I wish I could be there to join the fun!